The new Jebel Ali club was opened late last year to the public . It was one of Dubai’s oldest and most treasured venue but it had been closed for a very long time until recently when it was revamped and launched with a complete new and fresh look. 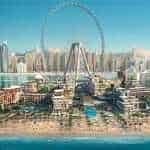 Jebel ali which few years back was considered in the middle of nowhere is now central to the future of Dubai and the re-opening of the club has added a new wave of excitement to its residents. 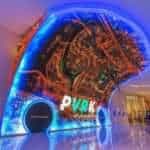 The visionary developers, Nakheel got the digital technology experts, Pixcom on board to provide an attractive visual technology to the Jebel Ali club before its opening. Pixcom team embraced the task and proposed a 360 viewing angle, circular digital display that would not only add a new life to the club but will have high visibility to the people visiting the club. This display may seem very simple but it was Pixcoms’ expertise in providing a light weight LED display that made this possible. Our expertise in providing a turkey digital display solution led us to execute a unique digital screen design and its complex implementation to perfection which highly exceeded customers’ expectations. Engaging customers via digital signage has come a long way, but the technology breakthroughs for this sector may just be getting started and we are leading the way to bring our customers the most innovative and impactful digital display products and solutions. Moving forward, the only limit will be the imaginations of our customers!